While most of us spent the last two weeks drinking eggnog and spending time with family and friends, Microsoft’s Sam Lester found an additional way to celebrate: creating a new blog series called “The 12 Days of Power BI Dashboards”. Each dashboard is based on a unique, yet common, data source that almost everyone can access. Sam’s goal for the project was to identify new methods for using Power BI creatively with data sources that don’t naturally align to reporting and BI projects. You can find links below to Sam’s 12 dashboards. Each link features a description of the data source and how Sam used it, and steps to recreate the dashboard for yourself. Some of the dashboards have also been shared on the Data Stories Gallery, and are embedded in the posts for live exploration. If you’re looking for inspiring dashboards to jumpstart your data analysis in 2017, check out Sam’s work. 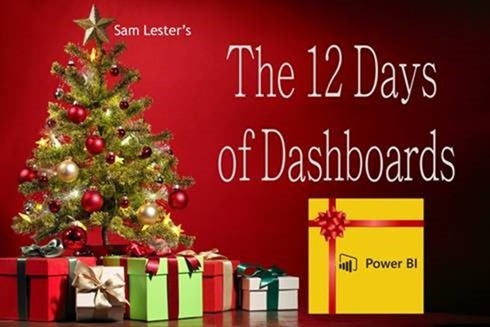 Sam reports that thanks to the 12 Days of Dashboard project he’s learned some new tricks, helped the Power BI team with product suggestions, and most importantly had a lot of fun. Thanks for sharing, Sam!